I have spent hours looking everywhere for the diagrams to make a sync adapter for my RFM so I can fit an LCD screen. I have finally done it and got it working, so thought I would share it here. 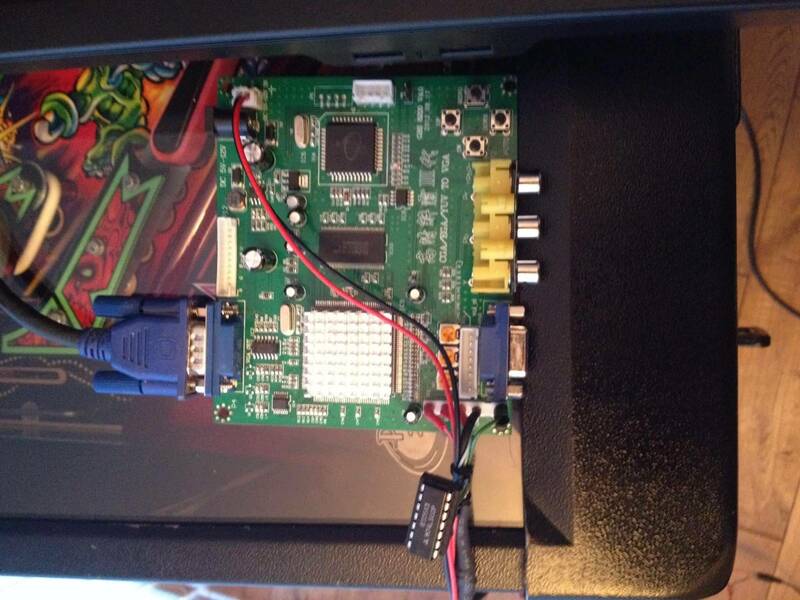 I bought a cheap cga to vga converter off ebay first - shown in the pic. 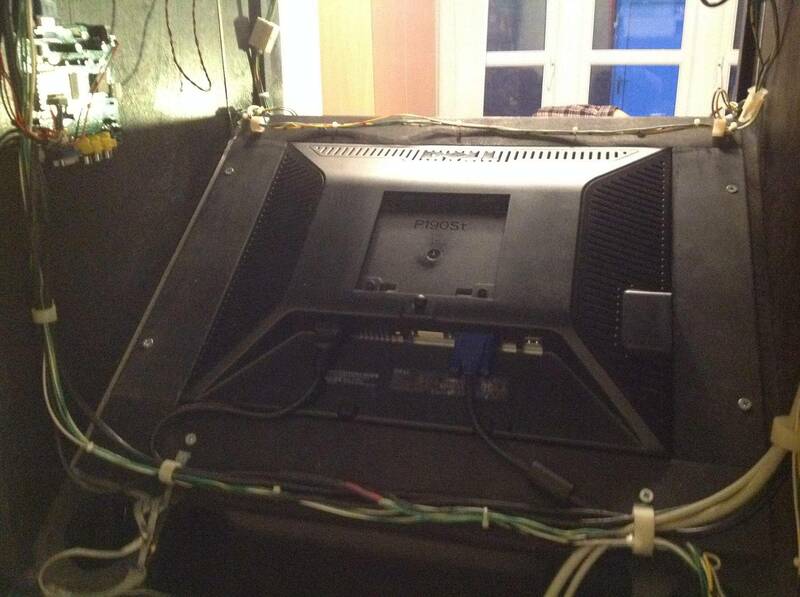 You will then need a vga monitor cable and a 74ls02 chip to convert the H&V sync to a combined sync. I used a Dell 19" LCD computer monitor I had lying around. First job cut off one end of the VGA cable and strip back the wires. You will need to find the red, green, blue, horizontal sync wire(usually grey) and the vertical sync wire(usually white). All the ground wires can be twisted together. sleeve each of the wires with heatshrink. Next solder the red, green, blue and ground wires to the respective pins on connector P3 on the board. That's it!!! plug in your new lead to the p2k PC monitor socket and put another lead between the vga socket on the adapter (P4) and your monitor and off you go. Mine worked first time so good luck!!! Will add more to this when I actually fit it into the RFM. Great job Newdos! I'll keep this forum when my monitor takes a crap. Thank You! No probs tony hope it helps!! Same here. Added to favorites. Nice how-to! Will be following this for updates to see how you mount it. Thanks! Well I said I would do it and I have finally got around to fitting a LCD monitor to my RFM, ably aided by my son Matt !! I fitted a 19" dell monitor which has a supply range of 100-240volt, which is handy as the main supply in the RFM after the transformer is 110volts everywhere. The pics have all uploaded in a weird order so I have put text next to each pic. Feel free to ask any questions. 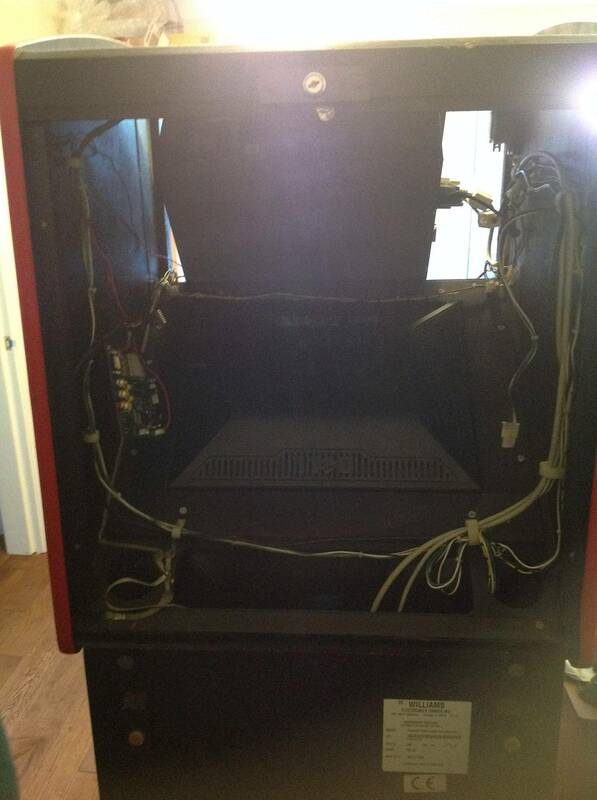 I can tell you this looks amazing compared to the old CRT that has some convergence issues !!! I have 2 videos of the old crt and the new LCD - there is no comparison!!! I don't seem to be able to upload them to here so if any wants to see them let me know and I could stick them on you tube. 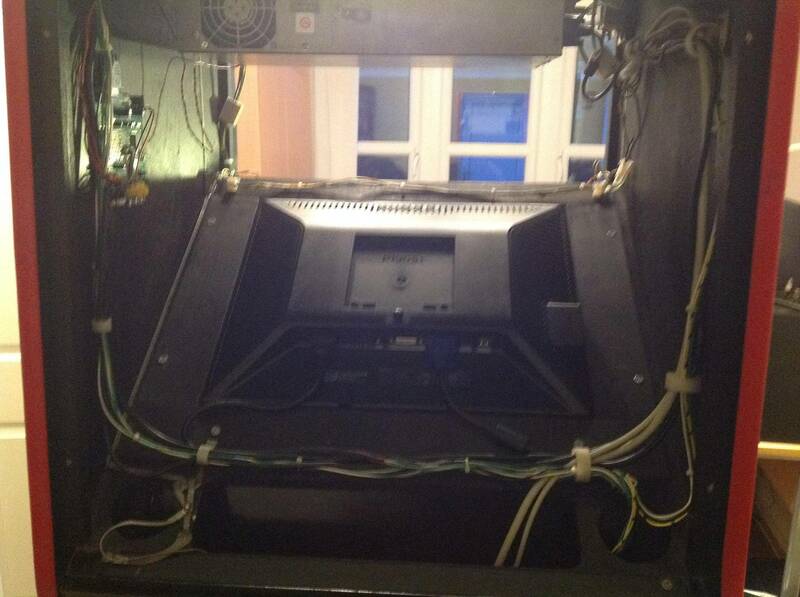 This pic below shows the cable mounts screwed back in place with all the cables nice and tidy, the CGA converter screwed to side of cab and the 110v power supply(the old green, white and black lead that powered the old CRT) spliced to the monitor power lead. This means the monitor power works through the main switch under the table as well as everything else. The image below shows how much space is left when finished, without the old CRT in there. As shown by my son Matt round the back of the RFM !!! Only thing left to do now is get a couple of brackets made to mount the fluorescent to light the translate now. This shows the monitor fitted in the hole where the old wells gardner monitor came out off. the monitor fitted perfectly and sat in the recess that was already there. You can see I made a wood surrounds and sprayed it black (well my son did!!) before I screwed it into the case. This actually held the monitor in place very tight. We had to remove one of the wood pieces to turn the monitor through 180 degrees (as the image was upside down at first) as it was that tight we couldn't get it out!! Let me know if they look ok and you can see the difference!! Is that P190St 5:4 or 4:3 (I couldn't find a definitive answer on the web) and does it matter? You bet I can see a dif. The lcd is way sharper and I can see the individual stars in the background of the Bally logo. Looks great. what is model # of the dell monitor that you used? mjmmx, I can see P190St on the back. 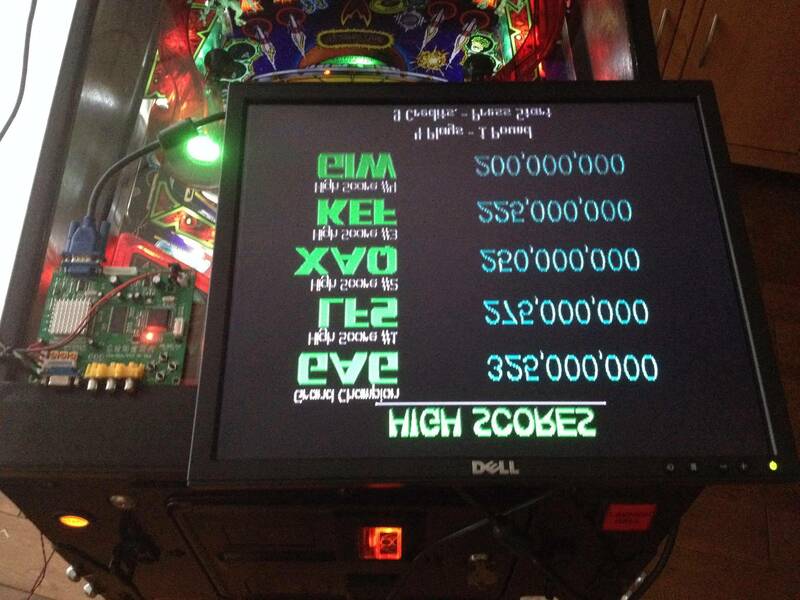 I try and do as many lcd conversions on arcade games as I can and I have run into sync issues with those. How would I know if I possibly need to add that chip onto one of those games as well? Its generally a since issue that I run into with them not being compatible. Just took out the old and looking for the right monitor to put in , just that the 2 that I have 1 is bulky and might have to take out of frame. Hope to get help as I move along on this project. I love this and have fun learning as I go . 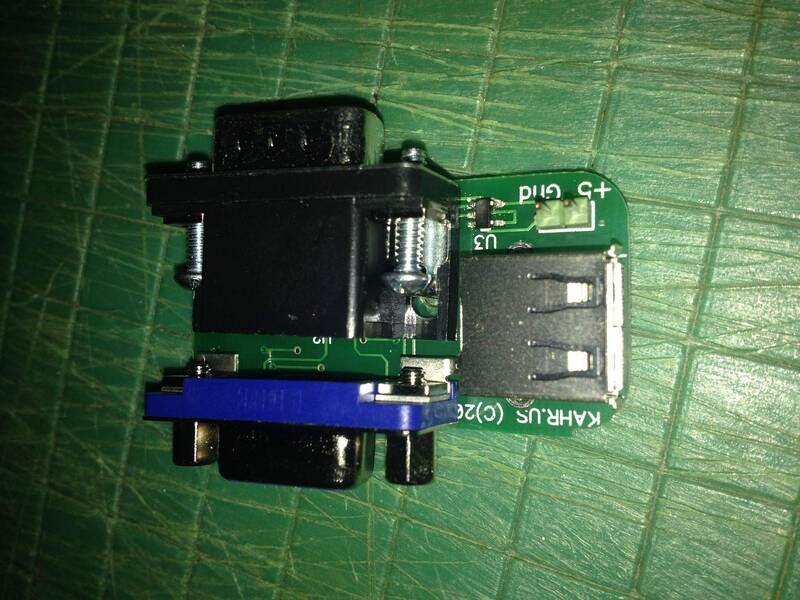 What happens if you use the cga to vga converter without a sync adaptor? 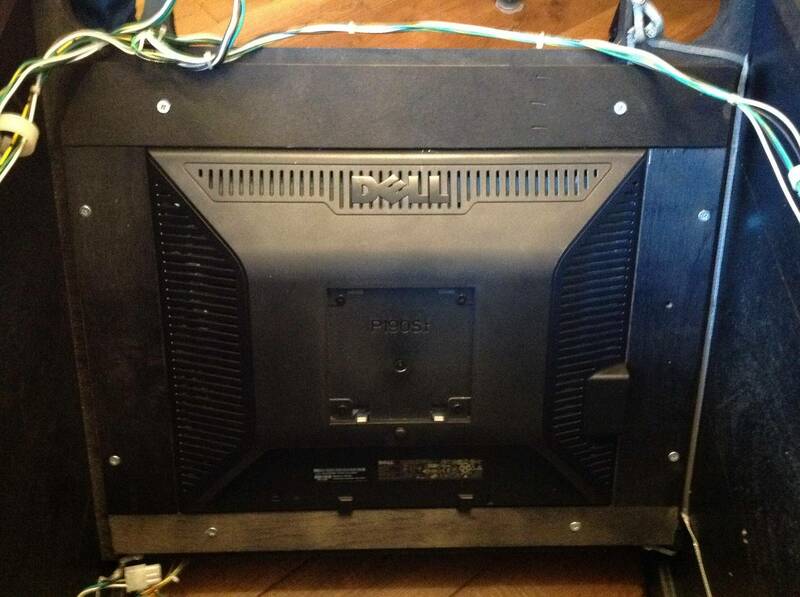 I ask because I just got an RFM that has this conversion but the monitor is missing blue. I have a spare cga to vga adaptor that I can hook up but I don't want to break anything. Just fitted a chip from maplins, same chip but ends with a N.
... No picture should the chip be a P.
Any thought's on a diagnostics. Just curious, does the monitor need to be 4:3? I'll be doing this over the next month, since my RFM I just picked up came with what looks like an unsuccessful attempt to install a widescreen 19" VGA monitor. I've also seen a 22" 16:10 recommended a lot and that is what I have in my game. A 19" 5:3 or 4:3 also seems to be fine. I picked up a SWE1 in February. I really wanted to convert to a flat panel (my CRT had no green and was mis-aligned) and combining the Horizontal and Vertical sync as described here is an important step - you have to do it if you are going to use the GBS-8200 series up converters. 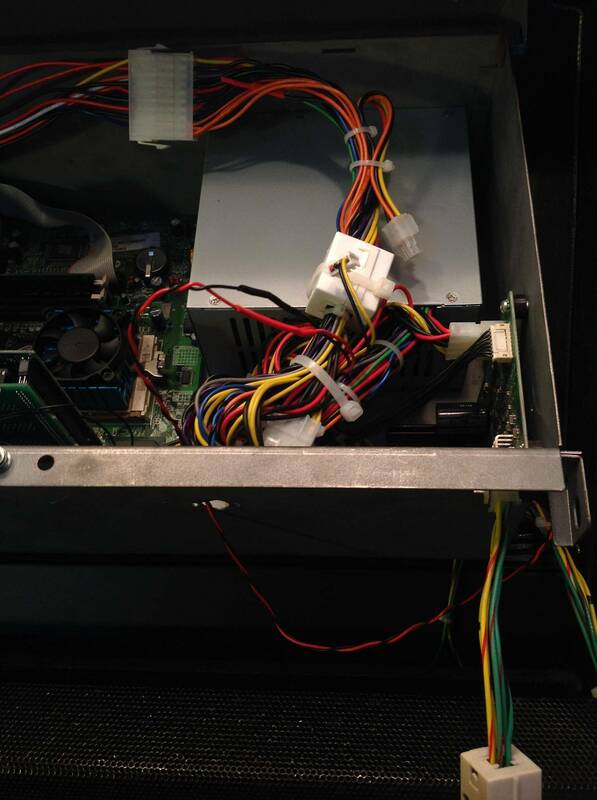 1. install a PCI USB card in your Pinball 2000 computer. This is a pretty simple, plug-n-play addition. No drivers to worry about as the computer can ignore the board; we are just installing it for power. I had to move my prism card over one PCI slot to create space. 2. attach my H+V Sync Combiner board the computer's video card output. It screws on securely. 3. run a USB A to A cable from the USB card to the H+V Sync Combiner for power. 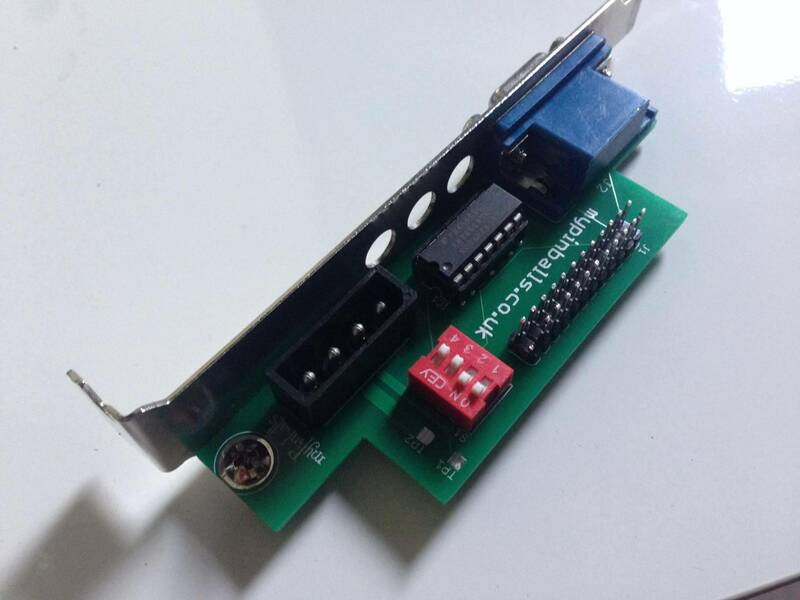 4. run a VGA cable from the H+V Sync Combiner board to the GBS-8200 series up converter. 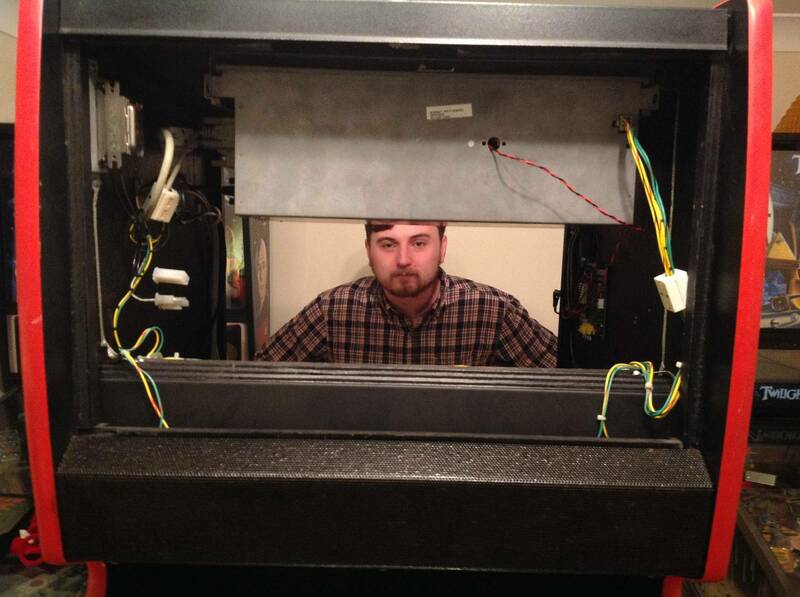 6. fabricate a panel mount solution and provide AC power to your monitor. 7. turn it on and enjoy. 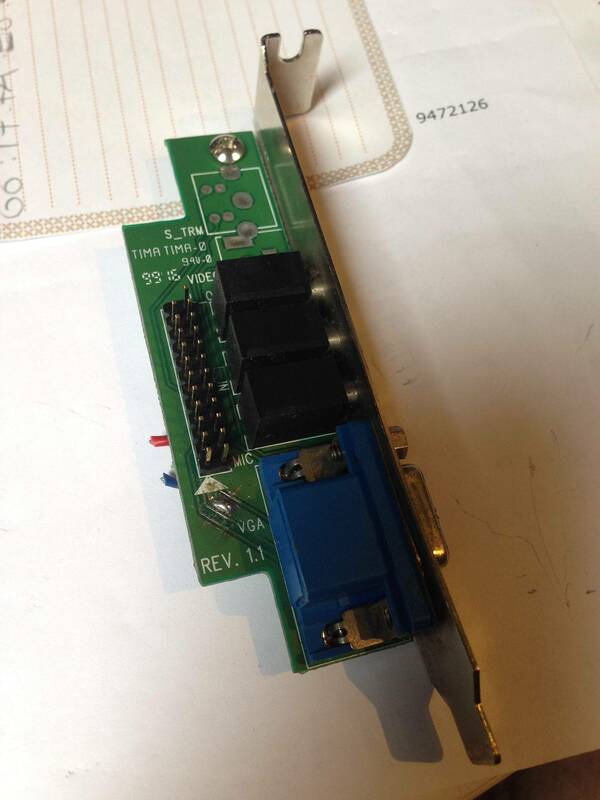 The GBS converter boards have a header for RGBHV (separate syncs). Why not just make the proper cable? Didn't try it, but it might work... Crimping JST is challenging but I've had pretty good luck with this tool: amazon.com link » . You'd still need to power the GBS which I think USB provides a pretty nifty solution. Crimpers?!?! Why bother? You can buy the JST connectors all wired up for pennies. 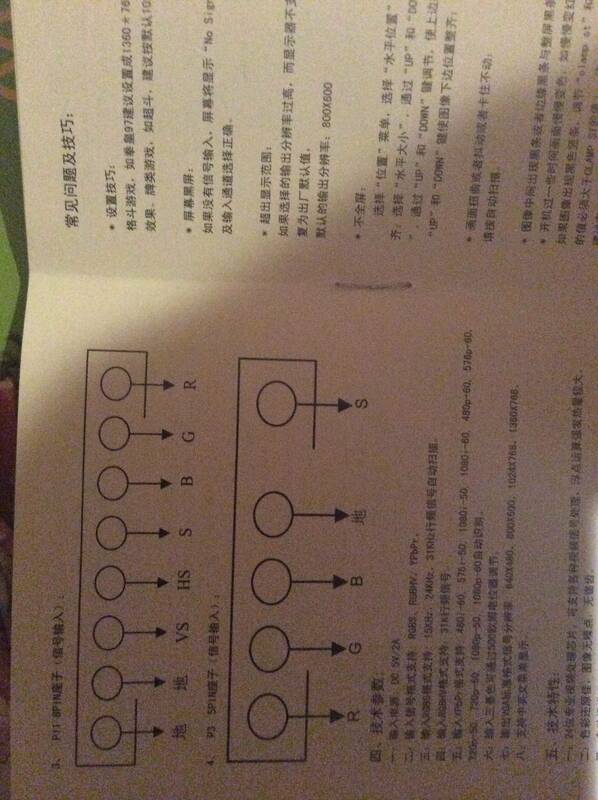 Let the little Chinese kids do the crimping. Curious, have you (or anyone else) connected directly to the RGBHV header on the GBS? I like RKahr's solution (less expensive than the http://lockwhenlit.com/CGA.htm option) but going direct might be a cleaner way to go if it works. Any examples online for a JST cable that could be used? I've used it successfully for some video games... haven't tried it with a P2K yet. I could wire it up and check. Ahh, cool! So if it comes with the cable, would only need a DB-15 to attach to the other end? I don't have a GBS card yet and it looks like there are 8200's and 8220's in various versions (Version 4 is the latest?). The only difference I have found between the two is that the 8220 has an extra VGA output. I suppose if you wanted to add a second monitor on top of the arcade cap. Buy it, try it, and if it doesn't work, get my combiner. And be sure to share what you learn. But I've only got 11 left and am not sure about making more. Most of the vendors today include the JST connector harness, not the 5 pin "yoke" style connector like they used to in years past. And yes, there are only 2 sync wires while there are 3 holes for sync. I guess that is their way of saving some pennies. All you do is decide if you want separate positive Vertical and Horizontal sync, or if you want to feed it just composite negative sync. You may have to move one wire. But, you have to make sure you select the proper input channel (RGBS vs. RGBHV). 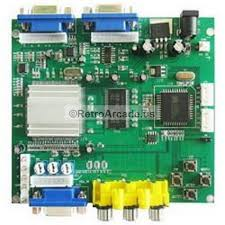 For most standard Composite Negative Sync applications (Jamma type boards), it is best to feed the sync in through the single wire to S. In the case of P2K, I would assume you will need to use 2 wires and make sure they are populated in the H and V holes of the connector. Update: I had rather stupidly worked out my pins incorrectly. It works now that I've wired it right and fortunately the IC survived having the 5v on the wrong pin. Anyone give the 8 pin connector a try yet? I thought about it but I wondered if it was not just the same thing as plugging into the 15 pin VGA socket. I've also got enough stuff to put together 10 additional kits of my H+V Sync Combiner. Awesome, looking forward to the results! On a model GBS 8220 V3.0, they are indeed the same. In fact, the HS and S pins are connected together and in turn, also connect to the 15 Pin VGA connector. This may not be true of other models or versions. Has anyone tried these as of yet? That's only a break out board. It does not alter the sync signal that is discussed above in the sync combiner/adapters (74LS02) being made. The trim pots are to tone down the Red, Green, and Blue drive so you don't saturate the colors on an LCD. Price is looking like £25 plus postage. Contact me if you are interested in getting one. Here's how it looks on the design bench. Looks like a nice replacement AppleJuice. How is it powered to do the conversion? I don't think it does any conversion, I think it just does away with the need to mess around soldering cables. The board is powered by connecting a standard atx D-type power connector at J3. The conversion of the sync signals is done on the card via IC1. 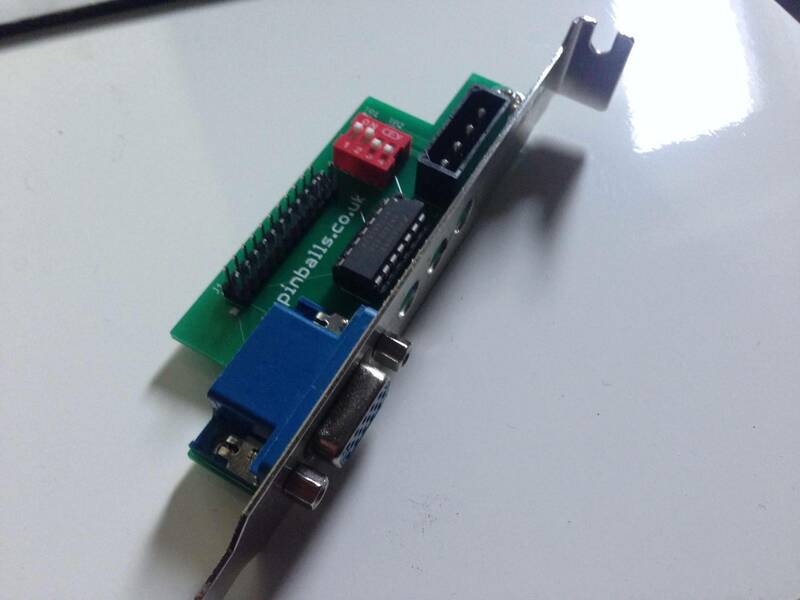 The output is then ready for direct input into an arcade cga to vga convertor card. It can also be used as a replacement for a bust original by setting the dip switches accordingly. I'm still confused about the need for 2 conversions but I don't need one so never mind. 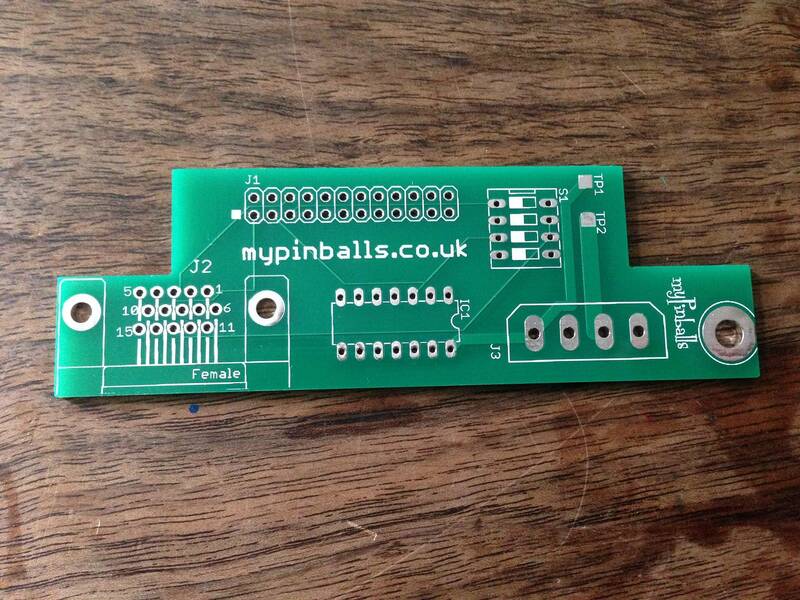 I got my pcb blanks in and am assembling the first batch of riser cards. I will be adding them to my web site store in due course. Contact me if you'd like to get one. What's with the dip switches? I looked on your site "more info" but is a blank page. Also I don't remember a cable like J1 crom the original cpu box. Any info yet on what the dip switch settings are? Well, my monitor took a crap on Saturday so it's time for me to read up on this switch out. Doesn't seem too terrible. Applejuice, will this put 5v on pin 9 on the VGA connection so you do not need a video amp if you are keeping it stock?